Shanshui Trends Hotel (Liyuan Branch) is in Guiyou Mansion, east Yunjing Road, Tongzhou district. It’s opposite Liyuan station in Batong Line, close to Jingtong Expressway and the intersection of Jing-Jin-Tang Expressway and Tongma Road. 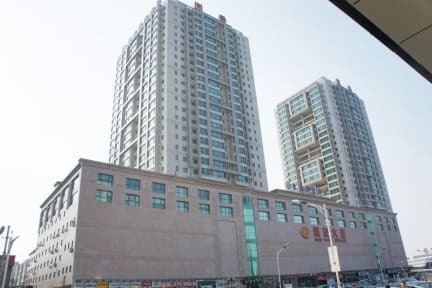 It’s in the heart of Tongzhou New Town and it’s only 12 km from CBD. Batong Line is just around the corner, you can get to Guomao, Beijing Railway Station, Wangfujing, Tiananmen and Xidan by subway, which is convenient despite the traffic jams. It’s 20 km, 30 minutes’ drive from Bawangfen long distance bus station; 33 km, 30 minutes’ drive from Beijing Capital International Airport. The hotel has 170 various guestrooms and it’s featured by fashion, uniqueness, value, taste and creativity. 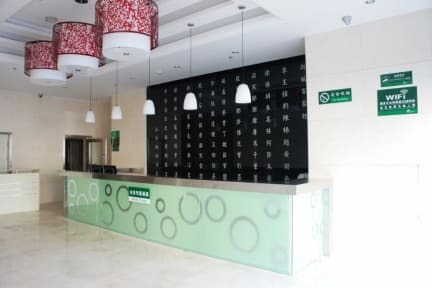 Shanshui Trends Hotel (Liyuan Branch) is the best choice for your trip! -Hotel will block the balance on credit card on guest's booking day to guarantee the bookings. -If the balance cannot be blocked, the room will be kept till 18:00 on arrival day. We stayed from 4th-5th as a stop over.Dirty dirty dirty rooms! There were bed bugs and termites and you can even judge that they're not keen on cleaning, I spot dirt and cigarette ashes lined alongside the corners of the washroom area and room. The sink is literally part of the room. Most importantly, it smells! Also there is no one from the staff who'd speak english or any other language, it's really difficult to communicate! Especially when the location is so far off from the railway station.